RADIO RETAILER OF AUSTRALIA was published from March, 1930 till November 1933 after which it became RADIO AND ELECTRICAL MERCHANT. From September 1935 it changed back to RADIO RETAILER OF AUSTRALIA. It was a weekly publication from December 1, 1933 through to May 1939, costing 6d and incorporated both Electrical News and Radio Review. On November 25, 1938 the name changed once more to RADIO & ELECTRICAL RETAILER and was still as a weekly until June 1939 when it became fortnightly which continued till April 16, 1947. 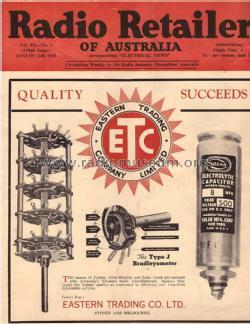 In May 1947 it changed back again to RADIO ELECTRICAL WEEKLY and was published into the 1950's. Click here for the 51 models documented in this literature, i.a.